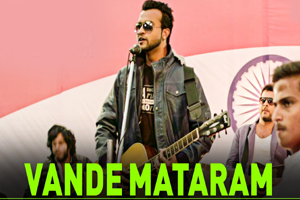 A patriotic song sung by Mahesh Matkar and lyrics are written by Rakesh Kharvi. Star Cast: Nishant Kumar, Neetu Wadhwa, Gulshan Tushir. The video of this song is available on YouTube at the official channel Zee Music Company. This video is of 2 minutes 05 seconds duration. Lyrics in Hindi (Unicode) of "वन्दे मातरम"